Gulseer, who goes by one name, is about 34 or 35 years old. His exact age has escaped him. He’s been married to his wife, Ayesha, for the past 10 to 15 years. The exact duration of their marriage has escaped him too. The Congress Party, it turns out, lost badly — catastrophically, some might say — amid wide dissatisfaction with the country’s infrastructural development, meager economic growth, and systemic corruption. Congress, which held 262 seats in India’s lower house of parliament, is projected to win 58 seats, the fewest its ever held since India’s first general elections, in 1951. The right-wing Bharatiya Janata Party, headed by Narendra Modi, is projected to win as many as 333 of the 543 seats in the lower house of parliament, called the Lok Sabha. Results of the six-week-long election were announced Friday. Despite Modi’s association with religious riots in the state of Gujarat in 2002, which killed more than 1,000 people, mostly Muslims, and his alliance with the Rashtriya Swayamsevak Sangh (RSS), a right-wing ideological body widely viewed as an extremist Hindu nationalist organization, he will become the county’s next prime minister after a fierce campaign during which he promised governmental accountability and economic stability. Rahul Gandhi, Indian National Congress’s candidate for prime minister and the scion of India’s Nehru/Gandhi political dynasty, will be a member of parliament and head a newly chastened Congress Party. Barowalia village, where Gulseer has lived his entire life, is in the district of Amethi, the heart of Rahul Gandhi’s constituency in the northern state of Uttar Pradesh. Even before election season started and Rahul Gandhi earned a reputation as a man too inept to lead the country, reports surfaced he was the reluctant heir to India’s first political family. But some supporters of the Congress Party in Uttar Pradesh refuse to believe this might be the end for the family and the political party that has defined much of India’s history. Take Gulseer, a Muslim who takes pride in the fact that Rahul Gandhi has been Amethi’s MP for the past 10 years. “Rahul Gandhi and I are nearly the same age, except I was born poor and he was born with a silver spoon,” Gulseer said with a smile and blinking heavily. He was wearing a beige shirt that had surely been several shades lighter at one point, and had rolled his dark trousers all the way up to his thighs to keep cool in the scorching heat. His wife, dressed in a violet salwar kameez and mustard-colored headscarf, stopped sweeping the floor to listen to him. A crowd of children and a couple of other women followed, as well as two teenage boys. “The best thing is that he keeps coming here,” Gulseer repeated to his audience. He claimed Rahul Gandhi had come to their village two to three months back, and again a two weeks ago. When asked how it was to see this long-lost brother, Gulseer played it cool. “It was fine,” he said nonchalantly, blowing smoke between his lips. Every political party in India has a particular social base, according to Ramesh Dixit, a retired professor of political science at Lucknow University, and the Congress Party has historically benefited from the support of three disparate groups: low-caste Hindu landless laborers, Muslims, and upper-class Brahmins. “Most upper-class Brahmins participated in the freedom struggle, and so they became part of the Congress Party,” he told me. Among those freedom fighters was Jawaharlal Nehru, Rahul Gandhi’s great-grandfather and India’s first prime minister; Nehru’s daughter Indira Gandhi became India’s first female prime minister in 1967. Like today, reports of corruption and disillusion at rising food prices started to plague the party during her rule, and Indira Gandhi was widely viewed as a ruthless leader — she imposed a state of emergency in India in 1975, which made the country a police state where no dissent was allowed and media was censored. But Congress lost support only momentarily. It was defeated in the following 1977 general elections, but its opposition party, the Janata Party, couldn’t maintain power because of its own internal struggles. And so the Congress Party came back to power in 1980, with Indira Gandhi becoming prime minister again. Indira’s son Rajiv Gandhi — Rahul’s father — became India’s youngest prime minister at the age of 40 after she was killed in 1984. With the help of the sympathy votes following her assassination, Congress won a majority of seats in the lower house of parliament during the 1984 general elections. But by the next general elections in 1989, scandals trailing the Congress Party brought on its defeat, and India’s first minority government, backed by the BJP and an alliance of other smaller parties, came to power. Yet the fickle nature of Indian politics besieged the bulk of the 1990s. Rajiv Gandhi’s assassination in 1991 again returned voters to the Congress Party, but general elections were held in 1996, 1998, and 1999 because these coalition governments couldn’t govern effectively. Although Atal Bihari Vajpayee of the BJP governed India from 1998 to 2004 — the only prime minister outside the Congress Party to do so — Congress became the ruling party again in 2004, with Manmohan Singh as its prime minister. History might be repeating itself now, with voters again upset at price hikes and massive speculation at corruption within the Congress Party. Yet against the backdrop of acres of parched land meant for harvesting wheat, small ponds, and skinny trees, Gulseer defended Rahul Gandhi and his party. “It’s not that he hasn’t done much,” Gulseer said as he began to dig up mud for a household construction project. But the laborer — who makes 150 rupees a day, or about three dollars, on the days he is able to find work — couldn’t come up with a concrete answer for what Rahul Gandhi had done for Amethi. Roads came into the village just three years ago. There is a one central well where people can fill large metal buckets with their daily rations of water. They get electricity about six to eight hours a day, though these days, because of election season, they enjoy a few hours more. 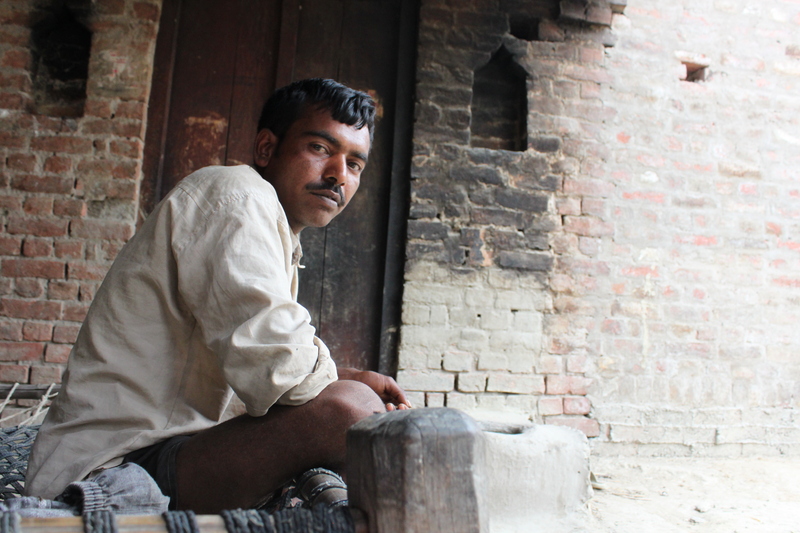 None of the 150 households in the village have any working toilets. “They’re broken-down and non-existent, so we have to use the fields,” Gulseer’s female neighbor lamented of their sanitation facilities. J.P. Shukla, a political analyst in Lucknow who covered Uttar Pradesh for 18 years as the state correspondent for the Hindu, one of India’s leading English-language newspapers, says the Congress Party has sustained a psychological grip on poor villagers in rural India, especially in places like Amethi that are considered Congress bastions. Now, in keeping with the Sanskrit saying of treating one’s guest like a god — Atithi devo bhavah — even the most hard-up villager probably has nothing but admiration for the Gandhis, says Shukla. But 60 miles north of Amethi in Ayodhya, the city considered to be the birthplace of the Hindu deity Rama and one of the holiest cities for Hindus, 25-year-old Kuttu Moriya has different reasons for supporting the Congress Party. Ayodhya is the site of a decades-long dispute between Hindus and Muslims over the site of the Babri Masjid, a mosque built by the Mughal Emperor Babur in 1528. A series of movements launched by the Vishva Hindu Parishad, a right-wing organization aligned with the RSS that is part of the larger network of Hindu nationalist organizations called the Sangh Parivar, resulted in the demolition of the mosque in December 1992. A mob of about 200,000 Hindu extremists brought down the mosque within four hours with hammers and their bare hands, according to media reports. The destruction triggered violence and rioting throughout India that left more than 2,000 people dead and 8,000 people injured. The site remains a contested area. Visitors can view the temple devoted to Rama, but reconstruction of the mosque is nonexistent despite the petitioning of activists and religious groups. On May 7, when residents of Ayodhya headed to the polls six different security checkpoints lined the path to view the Rama temple. Groups of about six to ten security officials, all of whom brandished rifles as part of their tan-colored uniforms, hovered at each station despite the meager turnout. The following day, Kuttu Moriya sat cross-legged on a bench perched on the banks of the Sarayu river, a tributary of the vast Ganges river that flows through five Indian states, including Uttar Pradesh. Young men were bathing in the river behind him, but Moriya, a Hindu, kept his eyes on the landscape in the opposite direction. He said he had voted for the Congress Party because he doesn’t trust what might happen with a Modi-led BJP government, especially given Modi’s affiliation with the RSS. Moriya shrugged off talking about unemployment and development, two issues the BJP has championed in its campaign. Instead, he pointed at a bridge to his left. “Look at the bridges, the roads! These are all from the Congress days,” he said. After the last day of voting on May 12, Congress supporters in Lucknow, the capital of Uttar Pradesh, were hesitant to talk about what the election results might mean for the Congress Party. “Let us wait, and then we will see what will happen,” said Shailesh Asthana, laughing. He’s a self-proclaimed “Congress man” who often comes to Indian Coffee House, a favorite spot among journalists and politicians in the city, to gossip about politics with his friends. The elections are always the first topic of discussion these days. Satyadev Tripathi, a senior spokesperson for the Congress Party who joined up 29 years ago, said he didn’t trust the exit polls. Forty-eight hours before the announcement of the results, he was sitting in his office at the Congress Party headquarters in Lucknow, entertaining a few journalists who were sitting on white plastic lawn chairs and relaxing in the air-conditioned room. Aside from the people in Tripathi’s office, the Congress Party building was virtually deserted. The first floor of the building was bare except for a few rusty bicycles that lined the hallway. Only a few laborers were working on a construction project near one door. A giant poster of Sonia Gandhi and Rahul Gandhi stretched the span of the wall behind his desk. The Congress Party symbol, the hand, was lined up just behind his head as he spoke. When I asked him what he thought of the Gandhis’ performance in this year’s electoral campaign, he deflected. He paused. “And the BJP… They are also being run by a family. That is parivar — the Sangh Parivar,” he said. Parivar means family in Hindi. “Whatever mandate comes, we will be happy to accept it,” he said quietly. Two days later, as the results of the elections started trickling in, all nine plastic lawn chairs in his office were occupied. Everyone’s eyes were transfixed on the flat-screen television mounted across from Tripathi’s desk. “It is a big defeat,” said Tripathi. The Congress supporters and journalists in his office started a heated discussion about where the party had gone wrong. But one Congressman was absolutely resolute this wasn’t the end for his party. “No! It’s not defeat!” said Shakeel Farooki, the secretary of the Congress Party office, after the discussion broke up. He and the others had started to leave the room. He spoke with urgency. This piece was originally published on May 17, 2014, on VICE News.